Welcome to Georgeallen.com, the official Web site of the George Allen. George Allen knows your right to privacy online is important. You do not have to identify yourself or divulge personal information unless you choose to give us your personal information. What information is being collected at Georgeallen.com? The only personal information collected is information you give us: In our effort to grow our George Allen grassroots community online, George Allen may at times ask you to submit information – such as your name, address, phone number and email address – in an effort to provide you the information you want in a more timely manner. If you choose not to give us any information, we may not be able to provide you with the most timely information pertaining to: online events, personal appearances, TV appearances, talking points, activists alerts and other campaign related information. How we use log files to better serve you: We use log files to assess the aggregate level of traffic to Georgeallen.com including what pages people are visiting, and to diagnose any potential problems with the Web site. This log file does contain an “Internet Protocol” or IP address that gives us insight on the general geographic area that visitors are coming from but not information on a specific individual. We do not use log files to track a particular individual’s use of Georgeallen.com. All users remain anonymous unless they choose to give us personally identifiable information. Information collected when you donate: When you make a contribution to George Allen, federal law requires us to use our best efforts to obtain the following information: your name, mailing address, employer, occupation, and the amount of your contribution. Federal law also requires us to report this information to the Federal Election Commission if your total contributions to George Allen exceed $200 in the election cycle. Any credit card information provided is only used to immediately process your donation. George Allen does not retain your credit card information once the donation is processed online. We do not retain your messages when you forward a message to a friend: Georgeallen.com contains numerous opportunities for a visitor to forward documents, photos, and messages to friends and family. Some features of Georgeallen.com may allow you to store addresses for easy retrieval and reuse at a later time. This information is stored for your convenience. We ask that children do not submit any personal information: In accordance with the Federal Children’s Online Privacy Protection Act of 1998 (COPPA) Georgeallen.com does not knowingly collect information from children. Additionally, In accordance with (COPPA), George Allen will never knowingly collect personal identifiable information from persons 13 years old or younger. Parents with questions may email webmaster@georgeallen.com or write to: Media Department, George Allen 2819 North Parham Road | Suite 210 | Henrico, VA 23294. How is the information collected at Georgeallen.com used? We personalize the Web site and email communications. 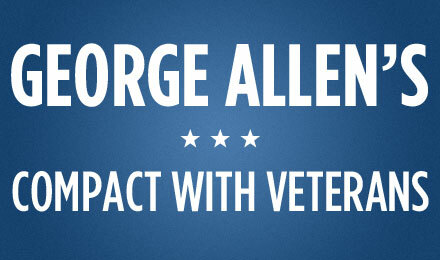 When you offer your personal information and/or choose to participate in our volunteer efforts, we use your information to personalize and customize Web pages and emails from Georgeallen.com to you. 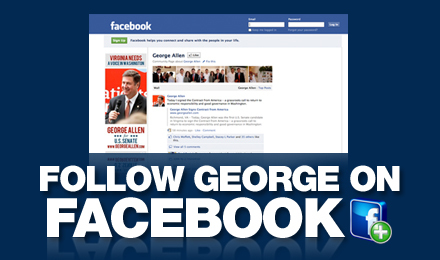 We also use the information to credit individuals for their actions in support of our efforts to elect George Allen. We will not sell your personal information. Under no circumstances will George Allen sell your information to any commercial entity. 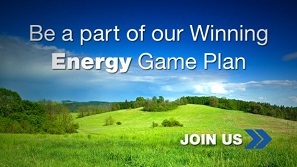 We may share your information with like-minded organizations. 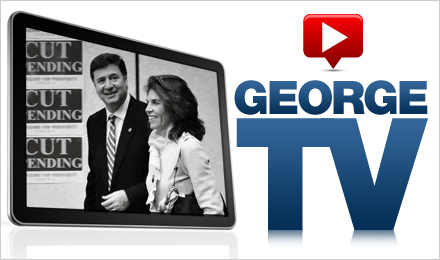 George Allen may share information — that you voluntarily provide us — with like-minded organizations and candidates who are committed to the same conservative principles of George Allen. George Allen may provide your email address or other personal information to authorized third parties required to deliver a particular service. These third parties may not use your information for any other purpose than to carry out the services they are performing for George Allen. Does Georgeallen.com policy cover how George Allen uses the personal info they collect? Information collected by George Allen is Non-Personally Identifiable (“Non-PII”) which includes IP host address, browser type, computer operation system, date and time of an ad request, and Internet Service Provider details. This information is identified using cookies, which are designed to serve users more desirable and relevant content while browsing the host site. This increases user experience, web functionality, and ultimately sorts information to increase accessibility to site visitors. Does Georgeallen.com policy cover data given to 3rd parties, and for what purpose? George Allen is a secure site, and employs a host of industry best practices to protect the exchange of information between site visitors and its host site. As no one method can guarantee 100% security, George Allen uses multiple methods of security and protection including firewalls and encryption. Information may be shared with unaffiliated third parties including, but not limited to, instances where the information is not personally identifiable, or if the host site feels reasonable obligation by law. How do you modify or delete personal info, or how to opt out? Note: If a user accesses the host site from a different computer or browser, or if the user deletes or restricts existing cookies, he should renew his opt-out choice from the above link. Protecting information you provide via Georgeallen.com. George Allen makes every effort to protect your information from the moment you begin to enter your information to when it is stored on our secure servers. Georgeallen.com uses a secure socket layer (SSL) – with the highest level of encryption commercially available – on pages where Web site visitors register or make a secure online contribution using their credit card. Strict security measures are in place to protect the loss, misuse and alteration of any and all information pertaining to Georgeallen.com. In addition, Georgeallen.com is run on servers located in a secure server room and locked in a rack. Staff is onsite 24 hours a day, monitoring equipment and services. Georgeallen.com uses a secured/encrypted server for online credit card donations. The online contribution form is in compliance with FEC regulations. George Allen has put in place appropriate physical, electronic and managerial procedures to prevent unauthorized access. Georgeallen.com links to other sites: Our site may contain links to other Web sites and servers. George Allen does not bear responsibility for privacy policies or content on linked Web sites. Because George Allen has no control over websites to which we provide links, you agree and acknowledge that George Allen is not responsible for the availability of resources or external sites and does not endorse and is not responsible or liable for any content provided therein. Accordingly, you also agree and acknowledge that George Allen will not be responsible or liable, directly or indirectly, for any damage or loss caused or alleged to be caused by or in connection with use of or reliance on any such content, services on or through any such site or resource or goods. We encourage you to read the privacy statements on each Web site you visit. George Allen provides links to original articles written and maintained by third parties. These links are provided as a convenience and do not imply a claim of ownership in that content. Can I change my information or opt out of campaign mailings? How to unsubscribe from our email list: Communicating via email is one of the most powerful online tools George Allen’s use. We’re sure you will find the information useful and take advantage of the opportunities to assist the George Allen campaign. From the picturesque Virginia mountains to the beautiful Tidewater, link by link, email to email, you are making a difference! What Terms cover posting information on Georgeallen.com? How do I contact the George Allen? Contact information for the George Allen: If you have any questions, comments or concerns, please contact George Allen by mail or by phone using the contact information published at the bottom of each page of this Web site.